Standard - £36.99 Only 8 left! Being a man-at-arms in the Dark Ages, there's always one more foe just around the corner. This can make it a real chore to perform routine tasks, like procuring victuals or cleaning out the castle's moat. Because whether you stumble upon an invading army, a covetous dragon, a hideous monster put in your path to test your virtue, or a band of highwaymen, you can't really afford to let your guard down. 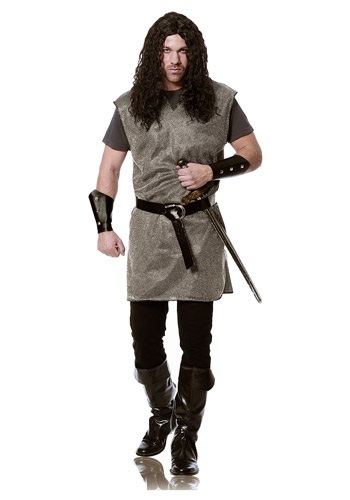 So this Medieval Tunic Costume is a wise investment. While its metallic mesh is not really designed to stop a blade, it will give your adversaries the impression that you're ready to do battle. And most of your cowardly opponents would rather catch you unprepared, so maybe a few of them will leave you alone, for once, and you can cross a couple of things off your to-do list! You might even have time to head down to the tavern afterward.